We have an extensive product range including; Simplex, Duplex, Tight Buffer, Central Loose Tube, Multi Loose Tube, Mini Cables, Micro Cables & Micromodule. 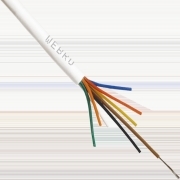 Many of our fibre optic cabling products are available for next-day delivery. In addition we also offer accessories such as Patch Cords, and the KeyFibre KeyQuick mechanical splice technology designed to make FTTH deployment both easy and cost effective.